This is the first time I’ve seen a Pina Bausch show in the flesh. It comes four years after her death and 28 years after she made this show. 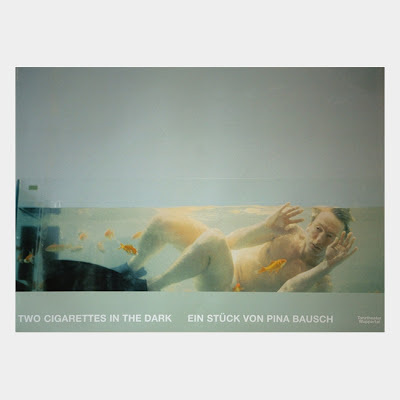 That Thursday night was the British première of Two Cigarettes in the Dark, which was made in West Germany in 1985 only makes me feel slightly better about the whole thing. 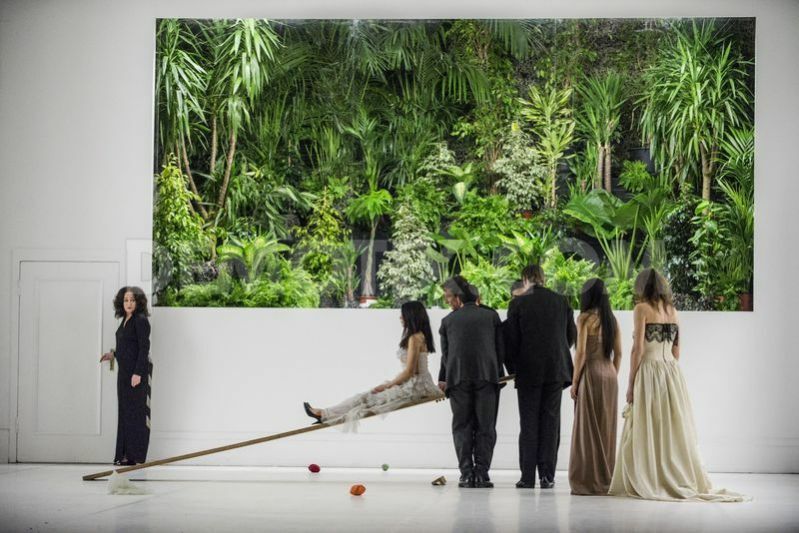 Don’t get me wrong, I feel like I’ve seen tonnes of Pina Bausch. I’ve watched Café Müller and Frühlingsopfer over and over on YouTube. I’ve seen the Wim Wenders film. 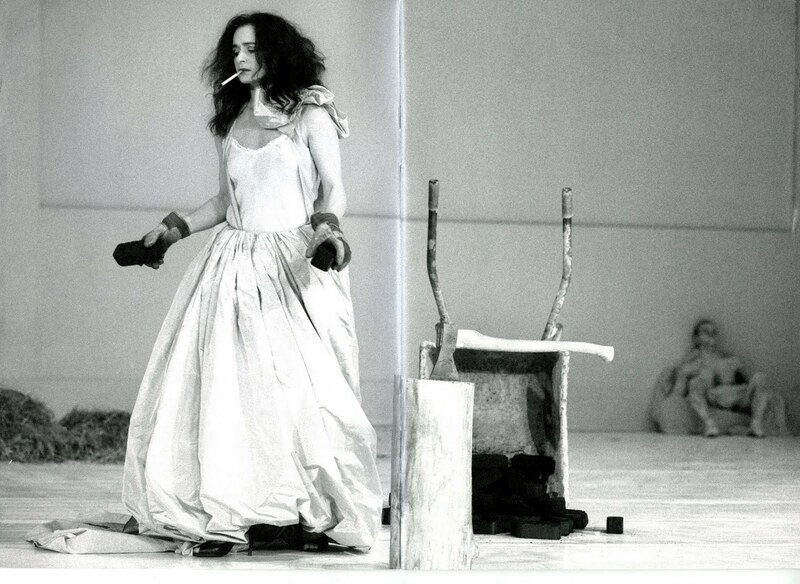 I’ve seen Alain Platel’s Out of Context – For Pina. Hell, I’ve seen enough work by Katie Mitchell and every choreographer Bausch has ever influenced (which often feels like every choreographer) to feel like I hardly stop seeing her work, and yet this is the first time I’ve really seen some of it. 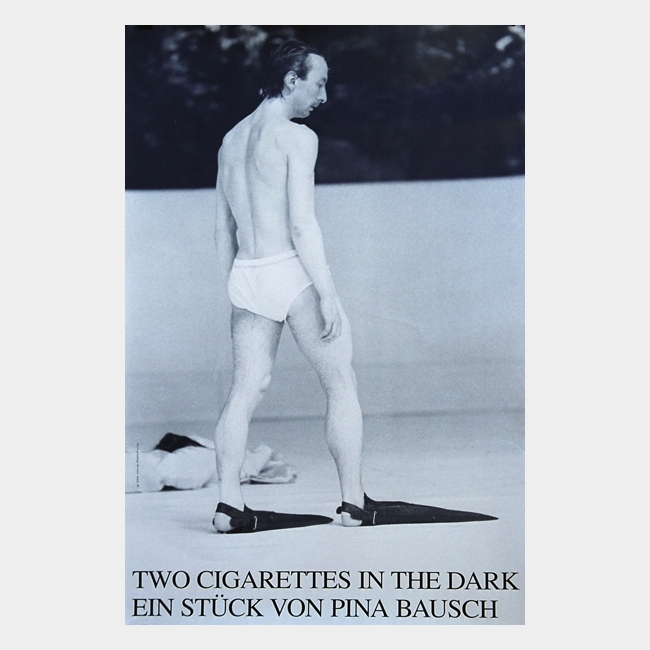 And what’s most surprising is how *unlike* “Pina Bausch” a lot of Two Cigarettes in the Dark feels. For a start, it’s actually a lot funnier than anyone ever talks about. I don’t know the canon of her work well enough to say whether this is a total one-off, in a minority, or whether her work and her reputation has been massively misrepresented by a posterity keen to concentrate on the beauty and tortured-soul stuff, but whatever is it, Two Cigarettes in the Dark is surprisingly wry and absurd to the extent that at times it resembles nothing so much as a choreographic tribute to Monty Python. It also recalls the sort of straight-faced silliness of Marthaler – especially his Meine Faire Dame, which I hadn’t expected. So, what’s Two Cigarettes in the Dark got? What does it do? Well, it’s set in a very large white room with large windows set into each wall. The window at the back gives onto a bunch of large tropical plants in an adjoining black room. The rooms on either side are white, and led up-to with staircases. There is a row of fishtanks placed against th window on the audience’s left. There are eleven performers. I think slightly more women than men. 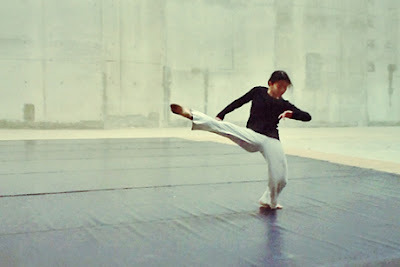 Unfussily multi-national, as dance companies tend to be. And mostly middle-aged. Not having seen the piece before, I don’t know if this is because it’s the original company performing the piece 28 years on (cf. Ostermeier’s Crave or that never-ending production of Arturo Ui at the Berliner Ensemble which has outlived its director Heiner Müller by 18 years). I rather suspect that here it was always middle-aged dancers. Bausch, after all, is famous for having worked with a far richer, more varied palette of performers than your bog-standard choreographer. And here, there’s not so very much of yer actual *dancing*. The piece does start with a frenzied explosion of repeated, compulsive arm flailing as one woman stands downstage rehearsing some sort of outward expression of inner torment. She is dressed in a low-cut beige ballgown. This seems like the sort of trademark Bausch thing that we’re expecting. Then (or was it before this) a portly woman dressed in a kitsch bathrobe wanders to the front of the stage and confides in a loud theatrical whisper that her husband is out. She then waddles the entire length of the stage back to the door at the rear and exits. Which is less expected. From here the stage is peopled by various ball-gowned or dinner jacketed visions of elegance, or aged elegance, or, in one repeated case, punctured dignity undermined by childish glee and/or senile dementia and eventually with diver’s flippers. There seems to be some repetition of patterns of domestic violence, but this is offset with sweet or amused tableaux – at one point a woman curled on the floor offers her partner a leg to hold in order that her entire body might be lifted up and used to break peanut shells. There is occasional talk of- or movement to suggest- angels. The use of music is no less intelligent than you’d expect. High-classical choral music – like the Bach used in Café Müller – recurs here, but perhaps with its sheer weightiness used against itself; its sheer over-wroughtness being deftly punctured by the pathos of the scenes it scores. Perhaps a joke by the artist against herself. Perhaps the most remarkable thing is how much, despite a total lack of any discernible narrative, it is possible to just keep watching, amused, entertained, sometimes moved and occasionally baffled for two and a half hours (plus interval). The evening – well, I was going to say “builds”, but it doesn’t really build, it just arrives – to a frenetic conclusion and then plauteaus out with a solitary performer slumped against a wall spray-painting himself white, with a pair of giant angel wings strapped to his back. I’d love to be able to suddenly pull and explanation out of the bag, and perhaps 28 years ago, all these symbols *read* a bit more intensely than they do now. One notices, for example, that the piece precedes Wenders’s own effort on angels Der Himmel über Berlin (or Wings of Desire as we have it) by only two years. Perhaps there was something in the West German water back then. But I’m afraid that’s not how I watched it. I was delighted and engrossed, but felt more-or-less entirely let of from having to really pin it down. Watching felt experiential rather than philosophical. I was more intrigued by the “how?” of the dramaturgy than the whys and wherefores. In other circumstances this might be accounted a failure. Here it felt precisely right. It’s exciting that the Print Room has given over a slot in its programming to a piece of newly commissioned contemporary choreography. Sadly, that’s pretty much where the excitement stops. I don’t deny that there’s a fair amount of talent sloshing around in Flow. The young choreographer Hubert Essakow has an impressively long CV as a ballet dancer, though his choreographic credits are noticeably thinner on the ground. Designer Tom Dixon by contrast has a whole OBE for his services to furniture design and apparently he even launched his own name as “a brand” in 2002. His contribution to Flow is a neatly made sort of Roman iceberg – that is to say, a four-sided, white material structure hung in the middle of the dancefloor that can be raised up into itself and lowered again. The piece begins. Slowly. With a hippy trapped inside this fabric iceberg, rolling a giant white glowstick around. Very. Slowly (see above). He is dressed in a simple off-white long-sleeve top and loose trousers. I immediately realise that I have a very real prejudice against light clothing and slow movement in dance. Composer Peter Gregson’s Music is also remarkably bland, consisting of a lot of over-processed piano notes, and (I think) some treated strings, as well as an atmosphere evoking the rain-sticks and pan pipes of a new-age store. It’s slow and mostly sounds like offcuts from Michael Nyman’s soundtrack to The Piano. Any one of these elements could have been bland – the slow-motion shape-throwing, the set and costume, the sonic backdrop – but all three is too much for my tastes. (And I readily concede this is a taste thing. I’m just not that into dance pieces that aspire to the condition of a scented bath with candles). But I’m not really qualified to talk about dance. The movement is all very proficiently executed. And you'll have seen it all before, I promise. I am being slightly unfair. I mean, the thing is completely watchable. It’s simple-minded beyond belief, but the execution itself is pretty (and you could well like the music a good deal more than I did, which would improve your enjoyment about 70%). There is also some rather nice work with a smoke machine (but nothing on that of Fujiko Nakaya in Gisele Vienne’s This is How You Will Disappear), and the – surprisingly brief – section with *actual water! * at the end is also pleasingly exuberant (but, again, nothing on Dave St Pierre’s Un Peu de Tendresse: Bordel de Merde or, I suspect, De La Guarda). As such, given the limitations of the size of the space (and presumably budget), it strikes me that the piece’s only option for being A Good Thing – beyond the basic excellence of existing in the first place – would have been for it to be strikingly intelligent. And it just isn’t. I mean, it even goes and puts the men in long sleeved tops and baggy trousers of rough material and the women in floaty, diaphanous dresses of a much finer, thinner material. And there are only two women to three men. And this isn’t even a piece about gender; these are just someone’s ideas about how men and women differ and what they wear. Really not even slightly intelligent or progressive. Indeed, the whole production team is male except for the person credited with creating the brief video projections (a video of some water, and, later, some sentences about water and the names of some water-bourne diseases, and then some static projected directly onto the performers later still). The Print Room has created an enviable reputation for itself as somewhere where you can see cutting-edge, intelligent work that might not embarrass us in Europe. On this showing, it would embarrass us at the degree show of any contemporary dance academy. Still, I do hope the lukewarm responses all round don’t deter them from searching out a different, better production team and trying again soon. Last night offered a programme of three short (15 mins, 18 mins and 22 mins – if the programme is to be believed. It sounds about right) pieces, plus intervals, for which £14 (£11 concs) seems maybe a bit steep, but it’s almost worth paying for the number of fag-breaks alone. So, ironically, emerging contemporary dance turns out to be the ideal artform for the chronic smoker. 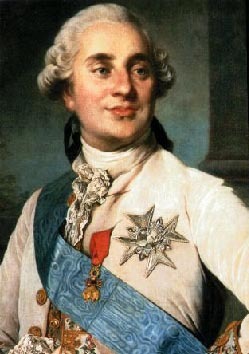 The brevity of the pieces also works in their favour. It’s one of those cases where it feels far more satisfying to be left wanting to see more of all three pieces, and to be surprised when each finishes. Of the three the first, Company Ben Abbes’s White Room is perhaps the least successful – four white clad women and one white clad man throw a series of not-especially new and slightly wobbly shapes purporting to explore life after death. Does the deceased soul gradually get used to being dead, they ask? Apparently yes, if accepting death is represented by finding a male dance partner. Still, the company seemed very young, and I’m probably being crushingly unfair. There was absolutely nothing wrong with the piece, just that – perhaps largely thanks to the choice of wallpaper music and white costumes – it felt a bit bland. Much more interesting was Tamar Daly and Nicolette Corcoran’s Decode This. [Full disclosure, I know Tamar a bit from Devoted & Disgruntled, but rest assured I still wouldn’t say I liked something if I didn’t.] I liked this very much. Tamar is the dancer/choreographer and Nicolette is a musician – on this showing, “musician” translates as (startlingly good) singer with one of those delay/loop/sampler thingies on a table in front of her. (At some point, someone really needs to write the long essay about the felicity of these delay/loop/sampler thingies for the solo performer conjuring the babble of modern communication technologies.) This is movement appearing to respond to new-minted sound. There’s a qualitative difference between this and dancing to recorded music. Here Corcoran conjures everything from deadpan morse code to a kind of ‘90s Bristol trip-hop, while Daly describes suitably twisty shapes around it. There’s also talking – almost in the style of stand-up – about finding a message on your mobile phone after a drunk-night-out. Dances About The Internet/Cellphones tend to be unsuccessful, so it’s a tribute to Daly/Corcoran that their attempts to dance a winky-face and the kisses at the end of a text are charming and witty. Stand-up choreography had never occurred to me as a genre before, but it’s a dead good one. The final piece is the more portentous Fade by the company Kaonashi, an exotic name for what appears to be the pet project of a bloke called Jim Sutton (choreography: Jim Sutton, sound-editing: Jim Sutton, costume coordination: Jim Sutton, etc.). Assembling an admittedly fine soundtrack of modern, clubby music (no, I have no idea about modern, clubby music. It sounded impressively with-it to me, but I’m a middle-aged theatre critic who uses the expression “with-it” seriously). The stage is thick with smoke machine smoke and bathed in nasty disco lighting. The four-strong company (Katerina Toumpa, Akiyo Ishihashi – both excellent, plus Chris Rook, and Jim Sutton(!) – both good) are dressed in an enjoyably preposterous admixture of Shoreditch twattery and Louis Seize-ure. And half white-face which, to their credit, they almost pull off. The dancing itself is a suggestive mixture of club-dancing, something a bit like the low-to-the-floor loping of Hofesh Shechter, and I think I even spotted a bit of Gangnam Style at one point. What it’s doing, what it’s “about”, is more mystifying. And the costumes don’t help clarify it one bit. There seems to be a recurring motif of thuggery, drunkenness and violence against women (and, at one point, between women). There doesn’t, however, seem to be any immediately obvious wider point or context (dear God, I’ve turned into Billington). It looks brilliant. Stylish, self-aware, and aggressive; but if it only exists to show us some men duff up and drag off some hapless womenfolk, I have an issue with it. On the other hand, it concludes with a fluffy toy penguin hurling across the stage on a radio controlled iceberg, which while not really an atonement for misogyny, does seem to hint at a more playful side to the piece. A piece benefit from a major re-assessment of its gender relations. Still, a good thing, all in all. I reckon randomly picking one of these every week they’re on next year would do anyone who did so a power of good. It’s good to flex different critical muscles.